Have you, your friends, children, or coworkers ever wanted to learn needlepoint, but perhaps don't know where to start, don't have a local needlepoint shop, don't know where to find the time, or all of the above? Now you can learn needlepoint on your own time, in your own home or dorm, from a talented teacher and designer. 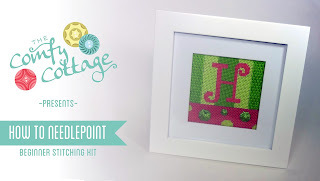 Beth Gantz has created a beginner's needlepoint design and video tutorial in collaboration with The Comfy Cottage. The class video is available for FREE on YouTube. Before you watch the video and fall in love with needlepoint, you will need supplies—but that part is easy (and affordable): purchase a specially made kit which includes a monogram canvas plus everything needed to complete it (needle, stretcher bars and threads, including Kreinik's soft metallic ribbon). The stitch guide and full tutorial video cover everything you need to know to complete your first needlepoint project. "We had a lot of fun creating this kit, and we're sure you'll have a lot of fun learning how to needlepoint with it. It also makes a great gift for kids, teens or the cross-stitch enthusiast in your life looking for a fun new hobby," said Hayley and Zachary from The Comfy Cottage. It doesn't get any easier than this…a basic but fun project, your own teacher, and a video to watch at your convenience. Needlepoint is one of the most creatively rewarding, relaxing hobbies. Once you start, you can find more supplies and designs at needlework shops, many of whom have storefronts and/or sell online. Ready? Let's learn to needlepoint! 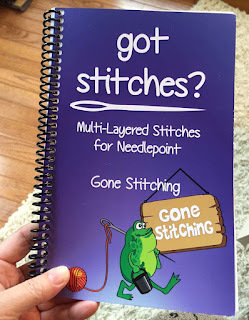 If you are tired of the common stitches often found in needlepoint, and want something with more depth and complexity, this stitch book by "the gals" of Gone Stitching may be your new go-to resource. Renee and Michele, of the fabulous needlework store Gone Stitching in Bergenfield, New Jersey, put together this portable encyclopedia of multi-layered stitches out of a true love for needlepoint. These women love to stitch, love to share their stitching (they were one of the first needlework podcasts, way back when the technology was new), and love to design needlepoint (see several terrific needlepoint projects they have created for stitchers via the Kreinik website Freebies section). They carry the complete line of Kreinik threads, among many other thread types, so they know a thing or two about using fibers. We'd trust them in a heartbeat for advice about which threads and stitches to use in your needlework. 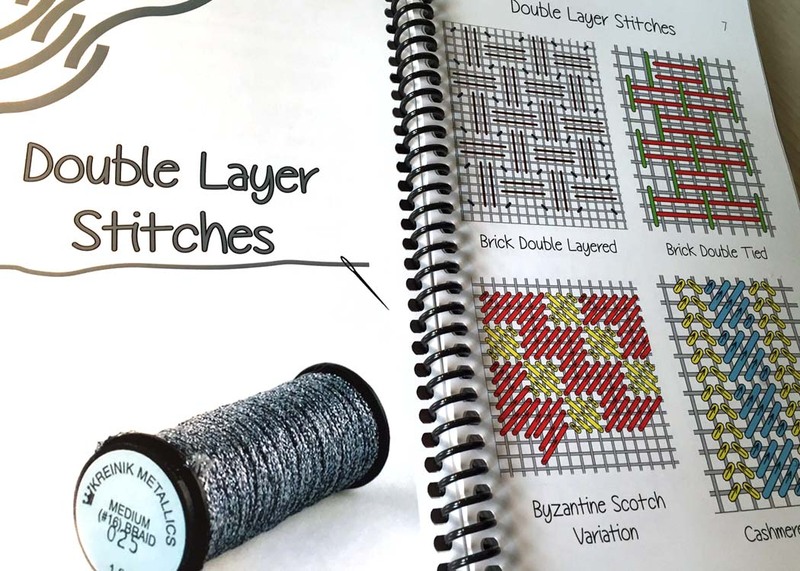 This book features colored stitch diagrams and photos in a 67-page spiral-bound book. The size makes it portable to slip into your stitching bag, or takes up little space on your bookshelf. They focus on using multiple thread types to achieve dimensional effects, which results in more eye-catching, visually dynamic needlepoint. Sound intimidating? Don't let it be—as Renee and Michelle have done in this book, start small and build up. 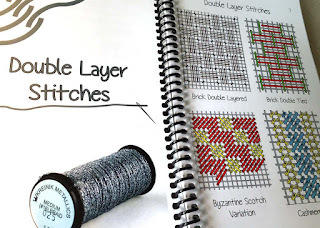 The first chapter is on Double Layer Stitches, then the book delves into triple and quadruple layered stitches. 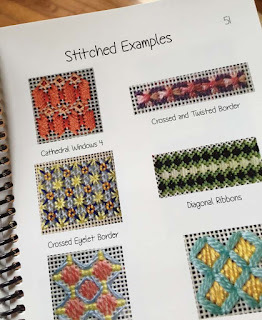 Additional chapters cover Trame Stitches (long horizontal stitches as a foundation for decorative stitches on top), and concludes with a photo gallery section of stitched examples (in color). The value of this book is the large number of stitch options. You will enjoy flipping through the pages, exploring all of the ideas. They can be easily stitched on swatches with threads you have at home just to practice and get a feel for the stitch effect. The book shows you how to play with stitches and threads—two of our favorite things about needlepoint. The book seems to be geared toward immediate to advanced stitchers. If you are a needlepoint beginner, you may be confused by the lack of numbers on the stitch diagrams (often used to show "bring your needle up at 1, down at 2, up at 3" etc). However, the diagrams are clear, colored, easy to follow, and do include directional arrows. We think they leave room for the stitcher to interpret in alternate ways if so desired, as part of an exercise in exploring creativity. "At our needlepoint shop we tell our customers every day to push their artistic boundaries and venture out of their creative comfort zone," say Michele and Renee. "We hope that this guide inspires you to do just that." For more information on the book or the shop, visit Gone Stitching at www.gonestitching.net. Today is Left Handers Day, one day set aside for lefties to celebrate, and be recognized for, being left-handed. Most of the people in the world are right-handed, so Left Handers Day raises awareness of the everyday issues that lefties face in a world designed for right-handers. Things as basic as a pair of scissors, for example, are designed for righties. Fortunately, manufacturers over the years have started making products specifically designed for lefties. 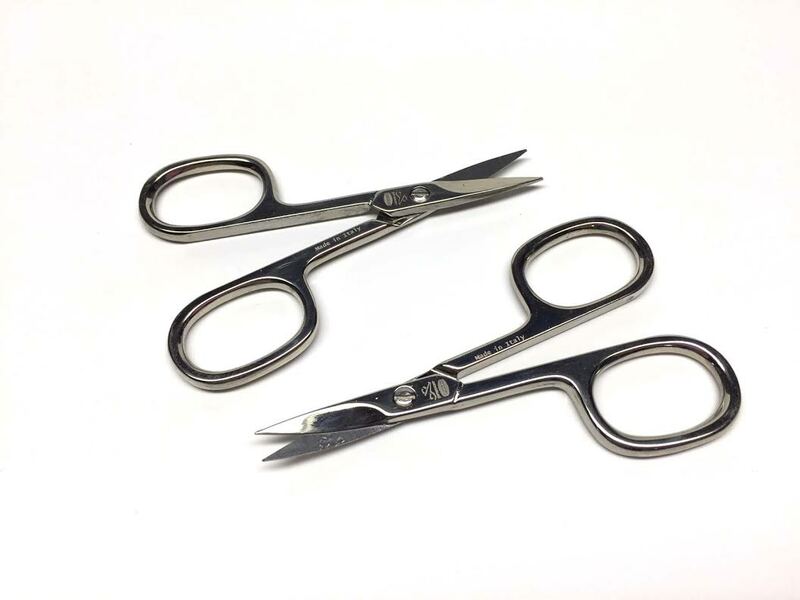 Kreinik is proud to offer stitchers a line of left-handed scissors created by the Premax company, which is a centuries-old company of artisans in the mountains of Italy. These scissors are primo cutting implements—sharp, smooth, quality, long-lasting. There are four scissors designed specifically for lefties, which means left-handed stitchers no longer have to "make do" with an awkward righty pair. 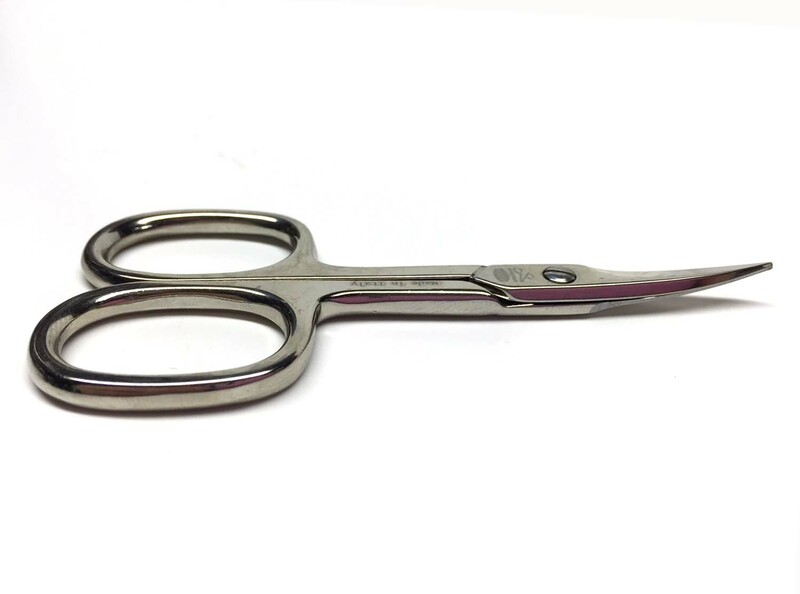 The curved-edge scissor is designed to get the blades into tight areas, like close to a needle on a sewing machine. They are also good for turkey work in needlepoint, enabling you to cut right where you need to for that texture stitch. Lefties, settle no more! You deserve a quality embroidery scissor design especially for your needs. Order the left-hand Premax scissors from your local needlework store, or from http://www.kreinik.com/shops/Premax-R-Scissors/.